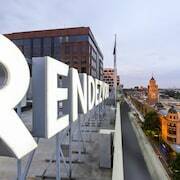 Holidaying in Melbourne and need somewhere to stay? Lock in a seriously good-looking hotel rate on lastminute.com.au. If our deals were on a dating app, you'd be swiping right on all of them! There's no need to stay anywhere else but in the thick of the action. There's a whopping 210 hotels within 2 kilometres of the city centre just waiting for you to snap up. Alleviate your FOMO and take a look at the scene at the Crown Towers and the Park Hyatt Melbourne. Both are right in central Melbourne. If they don't jump off the page, the Grand Hyatt Melbourne and The Westin Melbourne are also close. 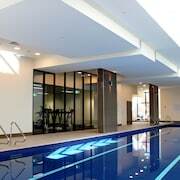 Think about finding a place in the popular suburb of Melbourne Central Business District. It has 184 options and is located just 0.2 kilometres from the heart of town! The AKOM Docklands and Docklands Private Collection of Apartments - NewQuay are a couple of suitable choices. 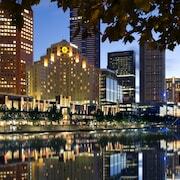 Heading to the Crown Casino and Entertainment Complex is a no-brainer! Can you say you went to Melbourne if you don't mark it off? How about staying within wandering distance? The Langham, Melbourne and Docklands Executive Apartments are your top options. The InterContinental Melbourne The Rialto and the Quest Southbank are close to the Melbourne Museum. Handy, right? The National Gallery of Victoria, just one more great attraction, is within a breezy stroll of the Clarion Suites Gateway and the Crown Metropol. 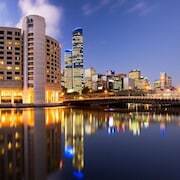 The Sebel Residences, Melbourne Docklands or the Mantra Southbank Melbourne have comfy beds for those who want to chill closer to Eureka Tower. 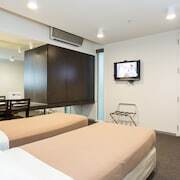 The Melbourne Short Stay Apartments MP Deluxe and the Tribeca Serviced Apartments Melbourne are no-brainers if Bourke Street Mall is more your vibe. Soak up the electric atmosphere when attending an event at Margaret Court Arena, renowned for offering outstanding entertainment. 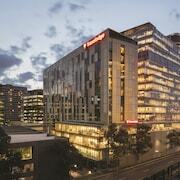 If you're wanting to stay close by, take a look at Melbourne Marriott Hotel and The Lyall Hotel and Spa Easy as! Take a look at the schedule at Sidney Myer Music Bowl for any events. 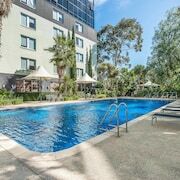 Melbourne Short Stay Apartment at SouthbankOne and Melbourne Short Stay Apartments are a couple of suitable hotels if you don't want to stay miles away. Totally over airport food? Longing for a bit of privacy? 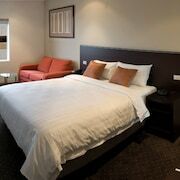 Then you'd be nuts not to snag a room at the PARKROYAL Melbourne Airport or the Holiday Inn Melbourne Airport. They're both close to Tullamarine Airport, 19 kilometres from the centre of Melbourne.